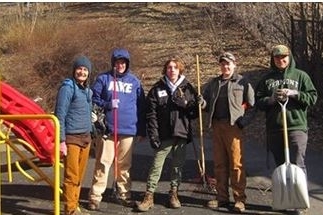 Despite the cold windy morning, the crew gave the ninebark shrub hedge along the fence a good pruning at The Mathewson Playground. This pruning of the dormant shrubs will help rejuvenate them for coming years. They also cut down all the lilac suckers on the bank except those on the existing lilac stumps. They cleaned up the rest of the area and we are ready for spring! A sincere thank you from the City of Barre and the Friends of the Mathewson Playground.